Engines surpass California Air Resources Board (CARB) 3-Star Rating, making them some of the cleanest running on the market-with 91% less emissions than traditional 2-stroke outboards! The inherent 4-stroke characteristics of ultra-quiet, smoke-free operation, plus smooth idling and running make these engines a natural choice whether you’re trolling for fish or out just for fun. Clean running 4-stroke engines from 2.5 to 20hp have a CARB three-star, ultra-low emissions rating. The decompression system and electronic CD ignition design ensure an easy, reliable start. One-stage over-rev protection and low oil pressure warning system provide extra peace of mind. Exclusive multifunction tiller handle on the 8hp and 9.9hp models features shift, steering, throttle, throttle friction, and stop controls for convenient one-hand operation. Available in manual-tilt, gas-assist and power-trim. All models are sold with a propeller. 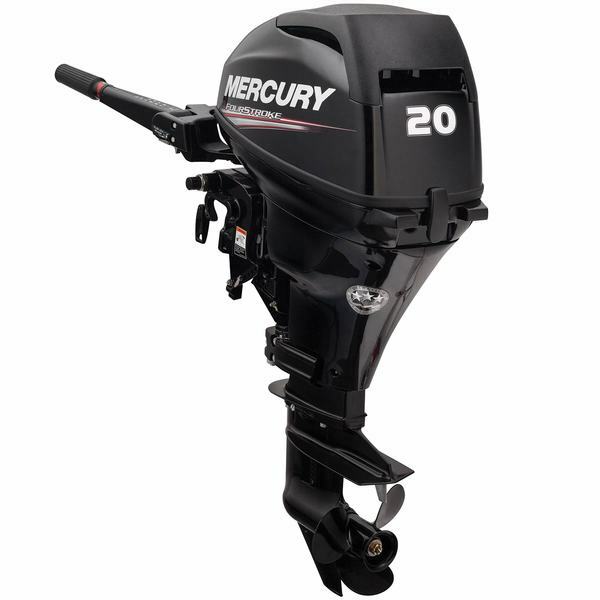 Note: These Mercury outboards have 4-stroke engines and, like virtually all 4-stroke engines, depend on oil in their crankcases for lubrication. To prevent the oil from leaking during transport, the engines are not shipped with oil in their crankcases. You must put the correct amount and grade of oil in the crankcase prior to the first use or you will cause extensive damage to your engine, which is not covered by your engine’s warranty. Please read the owner’s manual for more information.